DUMBARTON took a valuable away point against Airdrie at the Penny Cars Stadium — but it could have been three. DUMBARTON took a valuable away point against Airdrie in front of a 777 crowd at the Penny Cars Stadium — but it could have been three. The home side began brightly, but Sons were soon pressing harder and more consistently up front in an end-to-end first 45 minutes. Dumbarton deservedly went ahead on 28 minutes. A move involving Ross Forbes, Bobby Barr and Jack Aitchison fed Brad Spencer, who blasted the ball home from just inside the box for 1-0 (pictured). Sons continued to push forward until half time, and resumed where they left off after the break. It was almost two for Dumbarton on 65 minutes, when a shot from Barr flashed just past the outside of the post. 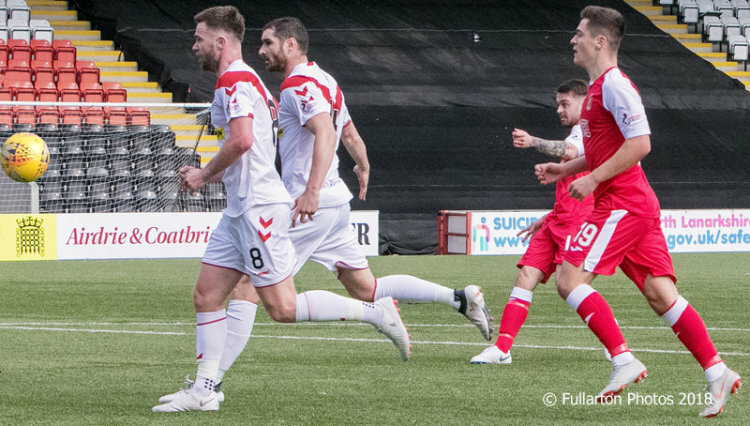 But on 70 minutes Airdrie found a gap in Sons defence and substitute Cammy Russell broke through to crash a shot off the post, before the rebound unluckily struck keeper Grant Adam and rolled in for the equaliser. The home side had their tales up after levelling against the run of the game, looking far more threatening as the match headed towards the final minutes. In the end neither side could find a way through again, as a resolute performance from Dumbarton lost momentum in the second half when victory seemed possible.